Auto Body Tec is our new car body repair company. In partnership, we have a combined total of 34 years experience working in the independant body repair of Ferrari and Maserati vehicles and now bring our skills and attention to detail to our own company. 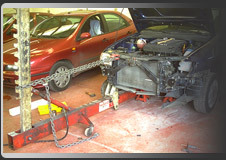 Situated a stones throw from Junction 25 of the M1 we occupy a large secure site so you can trust your vehicle is safe in our hands. to spruce up your commercial fleet, then we can handle that too. paint jobs i.e. racing cars.